Within the last year or so, I've converted to buying local honey. I figured that was one product that it would be easy to make the commitment with, given that even the tiniest farmers markets have a honey table. 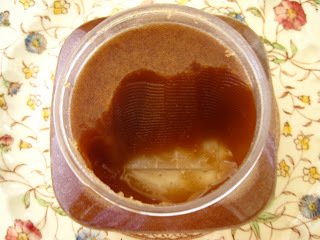 Then I started going for raw honey, which tends to be more expensive. But it's so much richer in flavor that once you start down the raw honey path, it's hard to go back--especially to the golden goo the average store sells that I'm not sure is even honey anymore. When I go to Whole Foods, I like to look around. Sometimes that's the only way you'll find the right products--or the fun products. In the honey section, my eyes alighted on this container of chocolate honey. I kept eyeing it, but decided it would have to wait given its nine or ten dollar price tag. And I already had plain honey at home. CC Pollen Co. was on the "local" shelves, but it was obviously only for the chocolate that I bought this. Nowhere on the container does it say exactly where the honey is from, so I wasn't going to trust the Whole Foods idea of local. Visiting the company's website, however, brings more vague information. Whereas I'm getting used to hearing such good things about local honey (like that it will help with allergies), CC Pollen believes that honey should come from a variety of plants and regions in order to create a "balanced nutritional profile." So while some of the honey probably does come from Arizona, it is also blended with honey from other states. This is all good and well if you're buying CC Pollen on a regular basis because you consider their products healthy. But how does this particular product (one of many flavors, in fact) function based purely on its flavors? It all depends on what you're used to eating. If you spread Nutella on your toast every morning and have never had raw honey, this could take some getting used to. Being raw honey, it's very rich and thick in flavor. When putting it on toast, at first, I added only a thin layer. Now that I've gone through half the jar, I find myself adding more. It doesn't taste like chocolate in the sense of eating a chocolate bar or perhaps even of eating Nutella. The chocolate is an accent on top of the honey, adding just a spritz of originality. Because the honey is thick, you can scoop it out with a knife and it becomes much like a natural version of Nutella (minus the hazelnut, of course). It's honey, but it's also a chocolate spread. Toast (with Scottsdale-made bread), butter, and chocolate honey become ever so much more wholesome and delicious than Pop-Tarts ever were. I probably wouldn't buy this honey on a regular basis, but it wins as an occasional purchase.